The mountains of Caucasus were once among the most rewarding regions for a traveler. Their unique ethnic (62 languages belonging to 5 major families), and cultural diversity could be comfortably enjoyed and studied together with beautiful nature and great collection of historical monuments. Unfortunately, the violent history of the region has never come out of the age of tribal clashes, blood feuds and colonial wars. It became worse than ever three hundred years ago, when Turkey and Persia, two long-time enemies of local people, were joined by Russian Empire - the most dangerous predator in that part of the World. 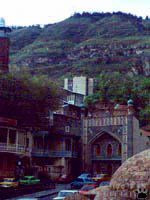 Russian invasion destroyed the unique civilization of Northern Caucasus; and the struggle for influence between the regional superpowers has fueled conflicts between Christian and Muslim ethnical groups. Later, genocide and forced displacements have turned the area into one large political minefield, with 4 ongoing and 20-30 potential ethnic conflicts. Still, the Caucasus is so interesting that some people risk visiting it. Few of them fall victims to street crime or large-scale hostage business, but others find surprising hospitality and peaceful lifestyle. Svanetia and Balkaria. The Main Ridge of Caucasus is a formidable barrier between Russian-occupied Northern Caucasus and the independent states of Transcaucasia. Few roads cross it, such as the old Military Georgian Road. Russian troops built it in the 1850-s. It is currently the most safe and reliable surface route from Russia to Transcaucasia. It passes through spectacular Darial Gorge, and then close to Kazbek (5033m/16,800') - the ridge's second highest mountain. Kazbek and Elbrus (5642 m/18,800') are both active volcanoes, but they haven't erupted in the last 500 years, so locals think they are extinct. Shali, Ichkeria. Along both sides of the Ridge, there are hundreds of isolated valleys. Some of them are pristine nature reserves,others shelter old colorful auls (villages). In some auls, each house has its own tower, where the family could defend itself in times of war. Auls of Ichkeria (Chechnya) used to be among the most beautiful, but many of them are being destroyed by Russian army, as this tiny republic fights for its freedom after many decades of cruel occupation and periodic genocide. 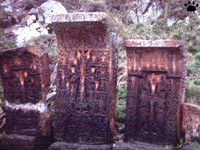 Tombstones, 6th century, Vedi, Armenia. Some local ethnic groups have been living at their present location for many centuries, using the same cemeteries and pastures. Cemetery, 3-20th centuries, Derbent, Dagestan. (4700m/15,660'), Svanetia, Georgia. My favorite part of the ridge is Upper Svanetia in north-western Georgia. In Ushguli and other local villages, all houses and towers are at least 500 years old. The lifestyle hasn't changed much, too. Tiny Svanetian churches are particularly unique - some are decorated with medieval silver casting, not with painted icons.West from Svanetia are some of the best-preserved natural areas in Asia, such as the huge Kavkazski Zapovednik (Caucasus Nature Reserve), famous for outstanding fall colors and floral diversity. Crocus vernus and Galanthus caucasicus, Kavkazski Zapovednik. Tsei, Osetia. On the northern side, Osetia and Dagestan are the most interesting. Osetians are direct descendants of the ancient Skiffs. They speak almost unchanged Skiff language (Iranian group), and worship a strange assembly of Christian and Pagan deities. Dagestanians are Muslims, and they speak 32 different languages. Tabasaran and other remote parts of Dagestan are the best places to see ancient Highland culture. 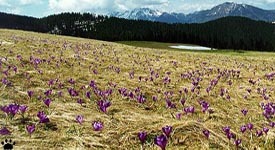 Various spring-flowering crocuses (Crocus), Caucasus. There are also many fall-flowering ones. Balkaria, Russia. Forests and meadows of the Main Ridge are among the few places in CIS where you can still see large herds of wild animals. There are also hundreds of endemic plant and insect species, and some birds and mammals that live only in these mountains. Among the most interesting are three species of ibex (Capra), odd rodent called Prometheomus shaposhnikovi, endemic grouse (Tetrao mlokosevichi), and snowcock (Tetraogallus caucasicus). Cherkessia, Russia. Few hundreds of European bison, and few remaining leopards of the largest subspecies (Pantera pardus saxicola), also live in nature reserves of the Main Ridge. East Caucasian ibex (Capra cylindricornis), Rutul, Dagestan. of Caucasus, but also from well-studied areas. Caucasus Reserve. Some parts of Western Caucasus get so much snow that the snow cover can reach 30 m (100').In 1987, the snowfalls were so heavy that avalanches destroyed hundreds of villages, and some thousand years-old Svanetian towers. I was lucky to be in the area at this time, and to see the ancient forests packed with snow up to treetops. From a rescue helicopter flying to some remote village, we could sometimes see up to 3 mega-avalanchesat the same time. Armenia. 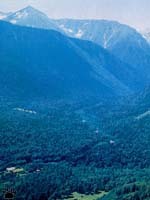 Fertile subtropical valleys of Transcaucasia had attracted conquerors long before Turkey and Russia appeared on a political map. From Argonauts to Assyrians, everybody tried to get his share of gold and other natural resources of the land. In Gobystan area of Azerbaijan, there is a rock with a collection of graffiti from Neolithic to modern time. Parthians, Arabs, Romans and Mongols had left their inscriptions in Gobystan, but all were sooner or later forced to leave. 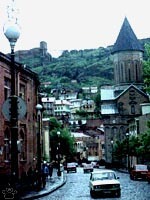 Zangelan, Armenia. Armenia has suffered the most from foreign invasions. Since the establishment of satellite Urartu kingdom by Assyrians in 9th century B.C., the country constantly struggled with surrounding empires. As a result, most of its territory was lost. Armenia managed to get back at least one small area during the war with Azerbaijan in 1988-1995, but was flooded with refugees (Azerbaijan had had large Armenian population). The country is still living in critical conditions. Surprisingly, its wonderful cultural heritage has largely survived centuries of war and genocide; the medieval architecture is particularly impressive. 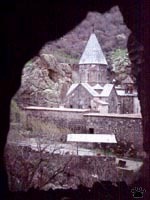 Dozens of churches, cathedrals and monasteries are scattered throughout the Armenian Highlands. Aragatz, Armenia. 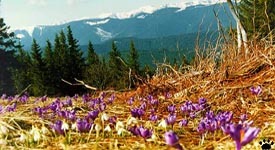 Armenia has Mediterranean climate and particularly diverse flora. It is the place many agricultural plants originate from. Some species of wild wheat still exist in the vicinity of Yerevan city. There are also many beautiful and rare flowers in Armenia, mostly in the southern part along the border with Turkey. Tbilisi, Georgia. 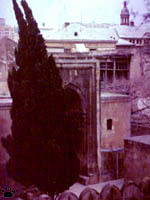 Georgia is another open-air museum of architecture, mostly dating back to 9-14th centuries AD. More recent architecture is also very original and colorful, particularly in Tbilisi. The old part of the city is a maze of narrow streets, temples of all religions, small stores and hidden atriums. The city's unique character, combined with hospitality and tolerance of its people, made it an artists' Mecca and the important cultural crossroads. Each backstreet cafe or workshop is reach in history; some stores have signs made by famous artists. Tbilisi, Georgia. 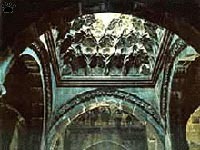 The Renaissance started earlier in Transcaucasia than in Western Europe. 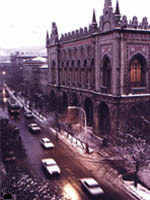 In 11-13th centuries,Tbilisi was one of democratic city-states, with humanistic ideology, flourishing art and literature. For some reason, the Georgian language is very conservative and hasn't changed much since than: modern Georgians can easily read books of Classic period. 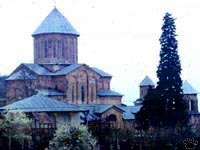 11th century, Mtskheta, Georgia. Mtskheta, the ancient capital just west of Tbilisi, is a good place to see ancient architecture, skilfully placed against beautiful natural background. Georgia Georgia consists of about 15 regions, each with its own dialect, culture and nature. Some of the World's most interesting caves are located in Georgia, Abkhazia and neighboring parts of Russia. Sataplia Nature Reserve near Kutaisi is the location of the World's largest collection of dinosaurs tracks. Ancient forests are well preserved and protected in many parts of the country. Kintrishi, Ajaria The western part is particularly lush and diverse. Black Sea coast had been lined by endless swamps and marshes until early 20th century. Later they were converted into resorts and fields, but some remains are preserved around Paleostomi lake. Beautiful subtropical rainforests cover the mountains of Ajaria, Abkhazia and Sochi area of Russia. They shelter many relict species from Tertiary Period, including more land snails than any other place on Earth. Eastern Georgia is more dry, there is even a small desert area in Vashlovani Nature Reserve, known for its reptiles. Old city, Baku, Azerbaijan Baku, the capital of Azerbaijan, is a beautiful cocktail of all possible architectural styles, from Medieval Persian to Baroque and from Byzantine to "Stalin's Soviet". The city used to have equally diverse cultural life, but, unfortunately, it mostly came to an end with the exodus of Armenian population in 1988. Most of Russian and Jewish population had also left the country during the 1990-s.
Azerbaijan Surrounding area is a dry wasteland, dotted with oil pumps and mud volcanoes. There are more mud volcanoes here than in all other countries together. They come in all sizes and shapes, and sometimes are very beautiful. Other oil-related phenomena include eternal gas flames, and tar pits with collections of prehistoric animal bones - a paleonthological bounty as rich as the famous La Brea tar pits in Los Angeles, California. Lowland Dagestan Caspian Sea is mostly surrounded by desert, except for its southern coast (coastal mountains in Iran and Talysh in Azerbaijan are covered with dense subtropical rainforests). Rivers entering the sea create a chain of oasises in the desert, with riparian forests and thousands of square miles of reed thickets. Word's largest population of sturgeon spawns in these endless labyrinths of tall golden reeds and clear water. The most interesting locations are Kyzylagach Bay in Azerbaijan, Agrakhan Bay in Dagestan, Volga delta in Russia, and the coast of Turkmenistan. Bay, Dagestan Wetlands around the Caspian Sea are prime wintering areas for birds from all over Eurasia; many rare species nest here as well. The sea itself is also interesting - its ancient fauna includes many endemics, such as Caspian seal (Phoca caspica). Taking a ferry to Baku from Turkmenistan in spring or summer is a good way to see the seals. Years of Russian control over Caucasus have been a time of ignorance, racism, and incompetence. Now, with xenophobia and nationalism at all-times high, Russia is rapidly losing what remains of its influence. No matter what the outcome of the ongoing wars will be, psychologically most parts of the Northern Caucasus are already lost for Russia. Kura River near Hilly, Azerbaijan. These nations will sooner or later become free, and their spectacular cultures will (hopefully) get rid of imperial unification. 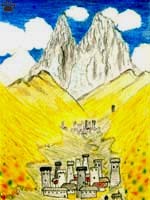 I expect the Caucasus to become again a tourist's paradise, with five-ten peaceful, exotic, beautiful, independent states, a place to enjoy diversity and hospitality. I wonder if it will happen in our lifetime.